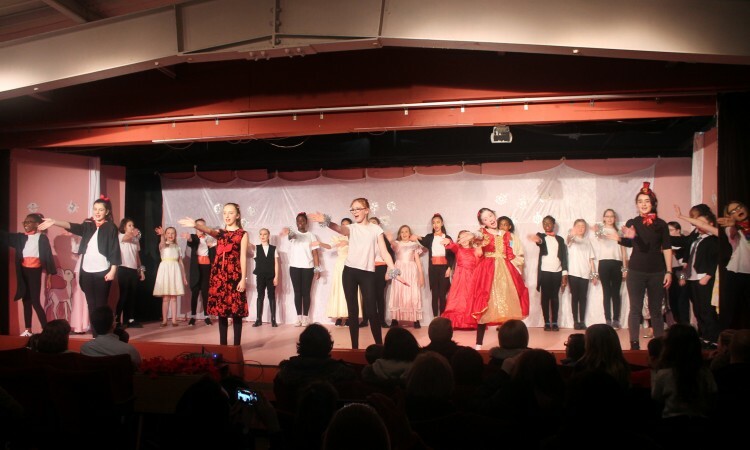 We hope you will have enjoyed some of our Christmas shows this year. 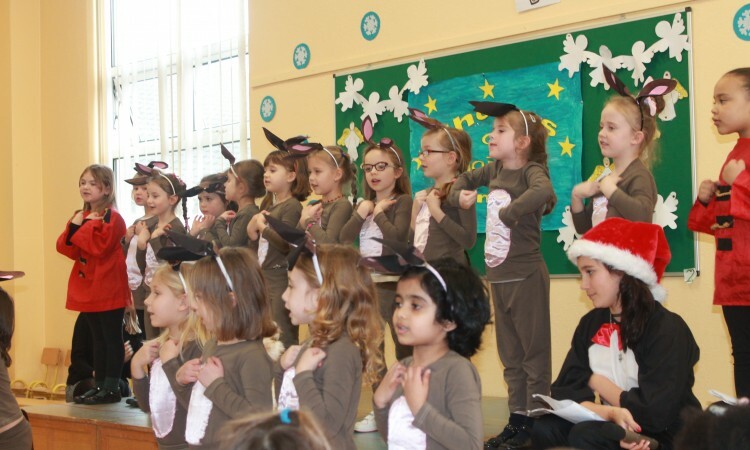 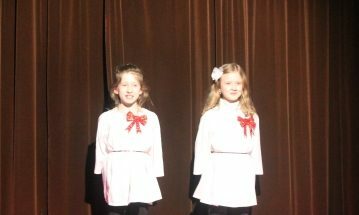 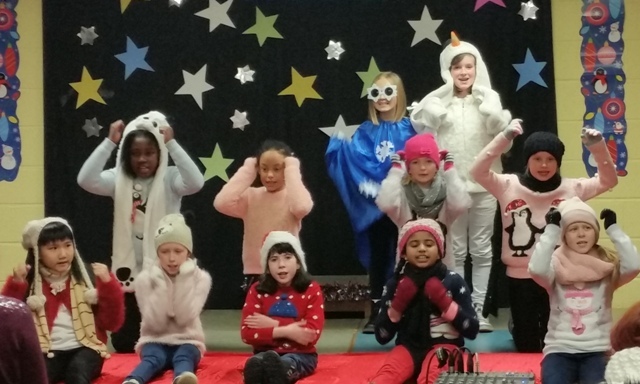 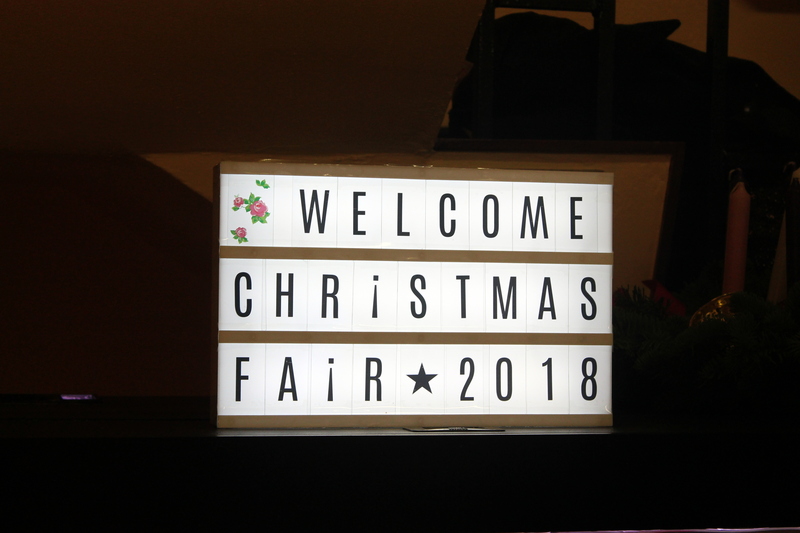 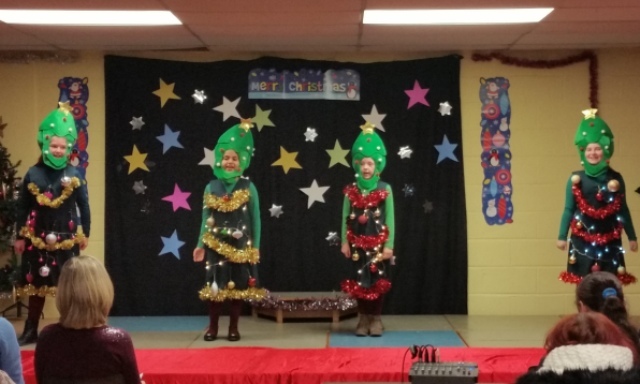 For the first time we experimented with a variety of venues for our Christmas performances: some of our Christmas productions were performed on stage at the community theatre; some were in the spacious community centre hall; and the infant classes performed in the school hall. 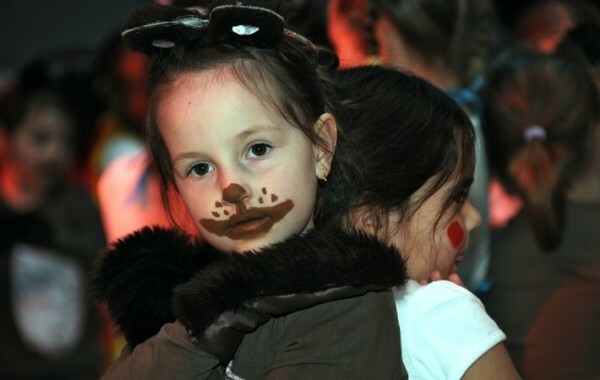 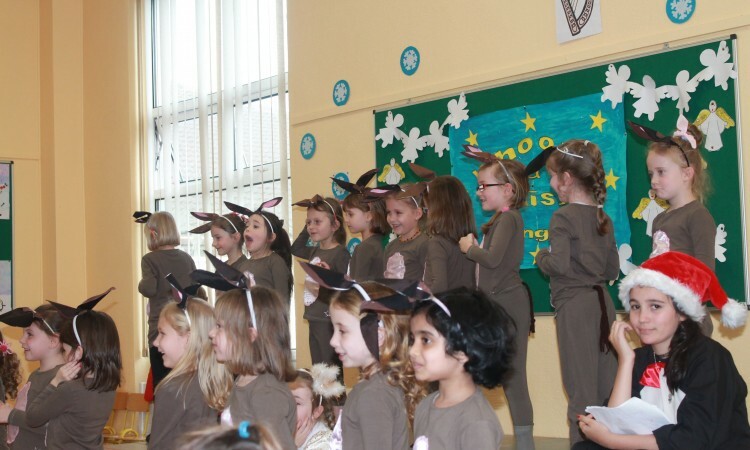 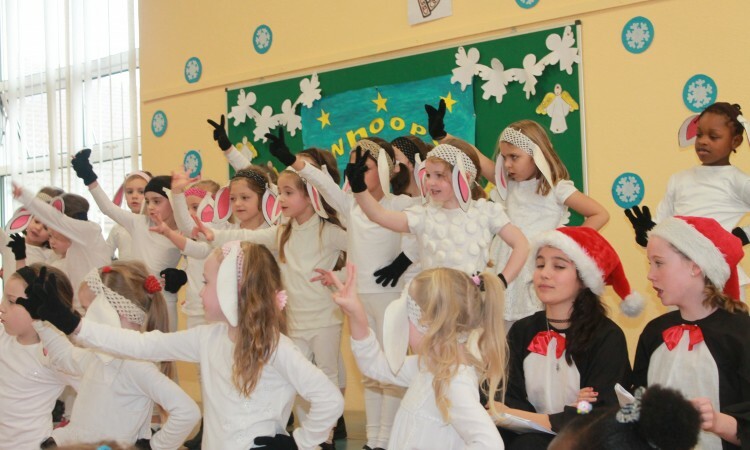 Each class group produced a show of their choice and parents were invited to come and enjoy the festivities. 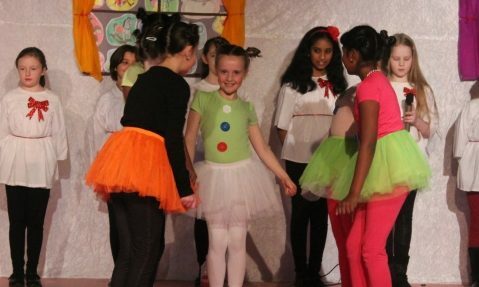 Colourful costumes, music, interesting story lines and most importantly the girls’ creativity and talents made each performance unique and special. 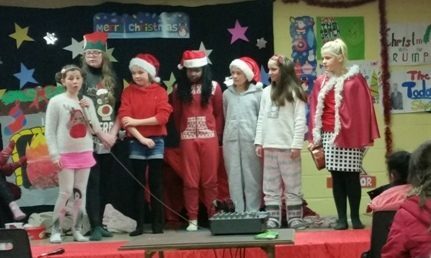 It has been a thoroughly enjoyable experience and a great end to 2016! 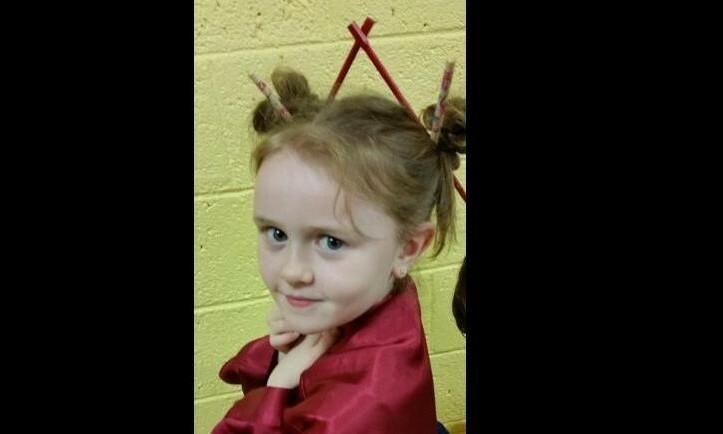 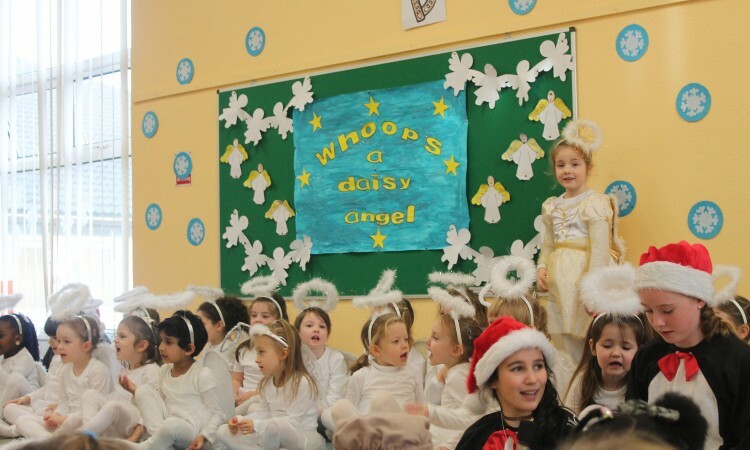 Junior and Senior Infants had three very successful showings of “Whoops-a-Daisy Angel” in the school hall. 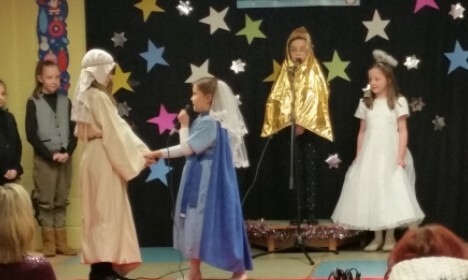 Poor Whoops-a-Daisy got everything wrong to begin with, but it all worked out in the end with the safe arrival of Baby Jesus. 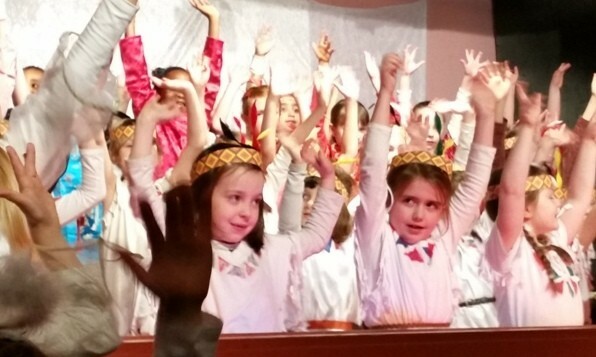 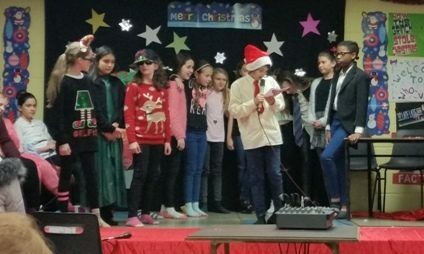 It was amazing to see such young children taking charge of the stage, singing all their songs, remembering lines and enjoying the story of Christmas. 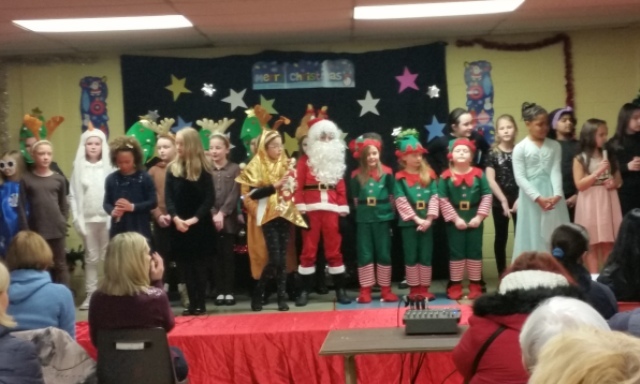 Well done to all involved! 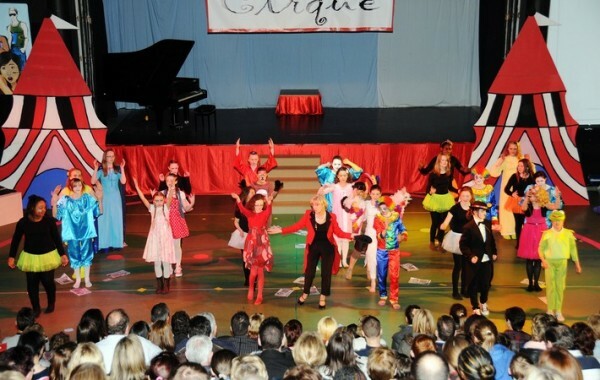 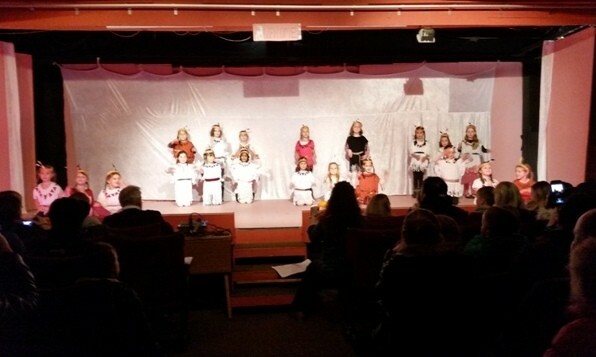 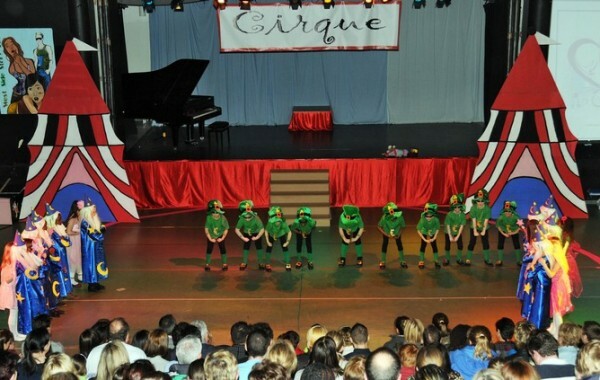 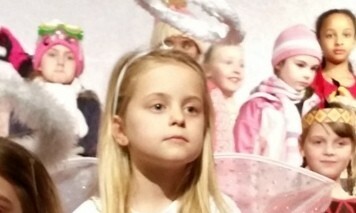 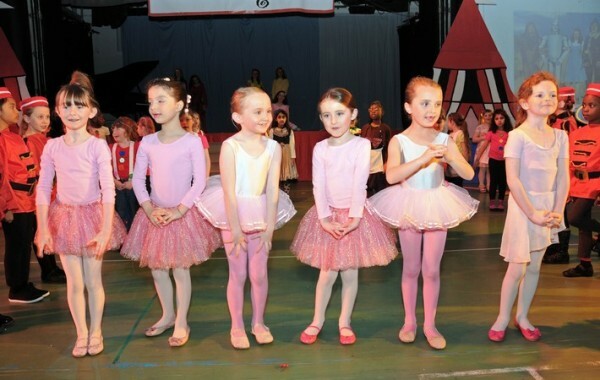 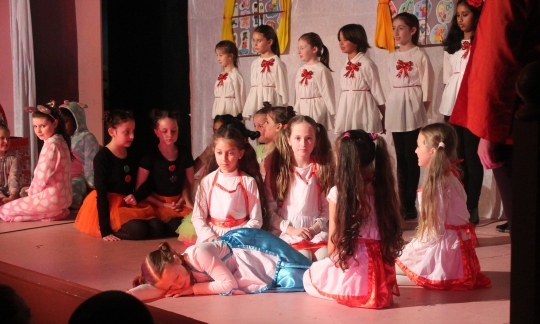 Our first and second class groups joined forces to produce a show called “The Smallest Angel”. 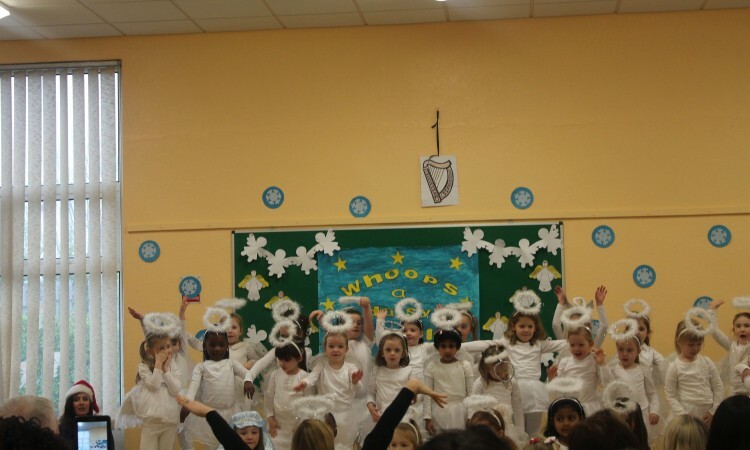 5 Angels were sent on a mission to find the best place on earth for Baby Jesus to be born. They didn’t have much luck until the smallest angel, exhausted from her travels, took a nap in a stable in Bethlehem…..which was of course the perfect spot for Jesus to be born. 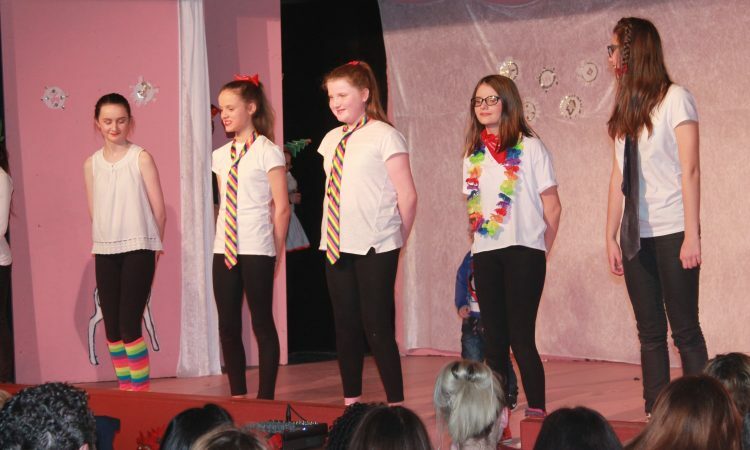 The girls really enjoyed giving us a tour of the world in this show. 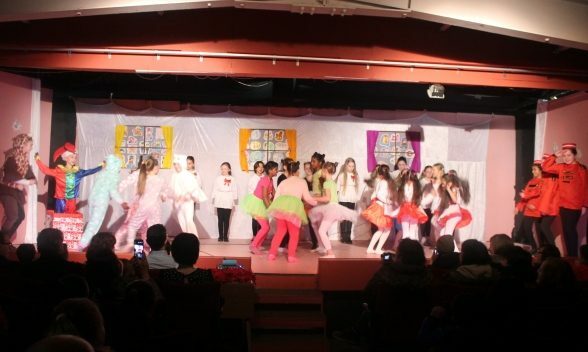 We loved the international aspect of it all, as well as the wonderful singing, dancing and acting! 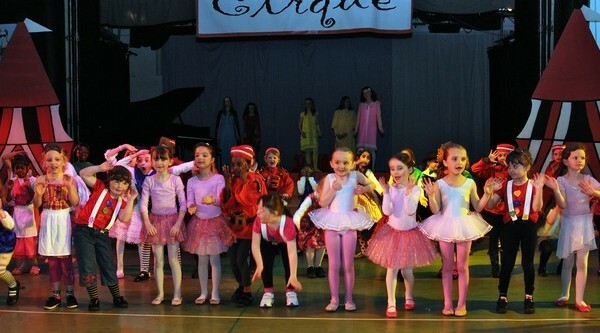 Bravo everyone!! 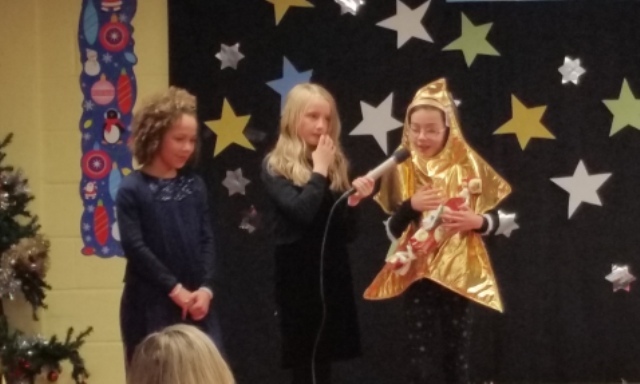 Third class decided to host an awards event this year: “The Stars are Coming out for Christmas”. 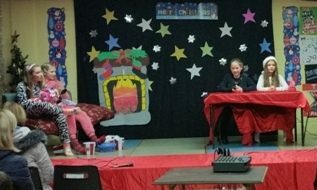 There were some very worthy contestants: Christmas Cards; the Christmas tree; Santa and his elves; and Christmas Dinner. 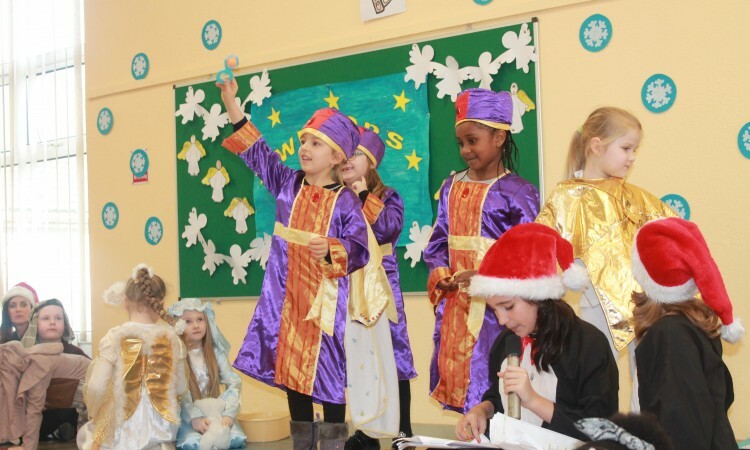 A surprise last minute entry, “Beth” – the star of Bethlehem (the celestial sort) stole the show and won the award for the “Most Outstanding Contribution to Christmas”. 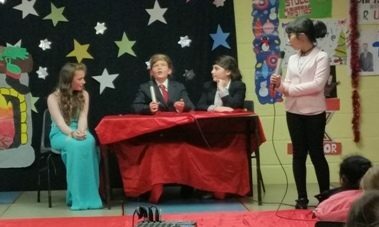 In this show we loved the jokes that just kept on coming from reporters on the red carpet, the professional hosting of the event, the music, the dancing and the poetry. 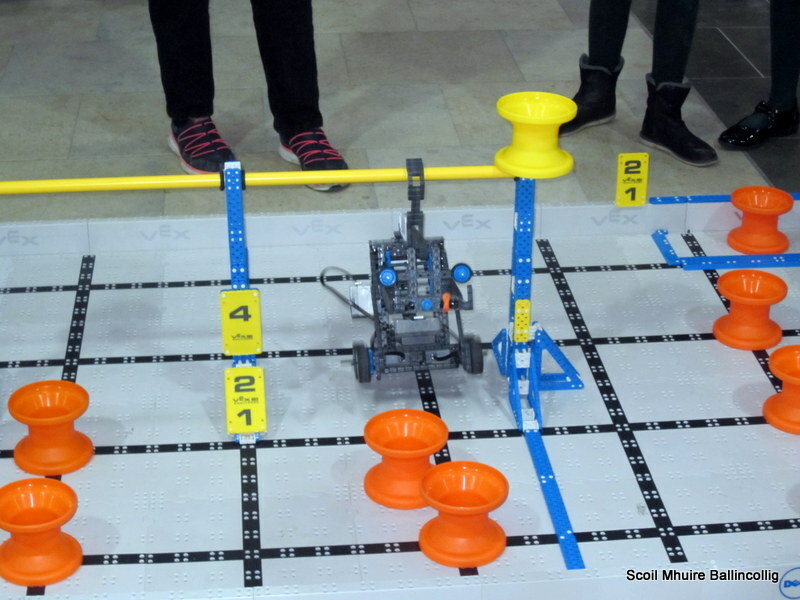 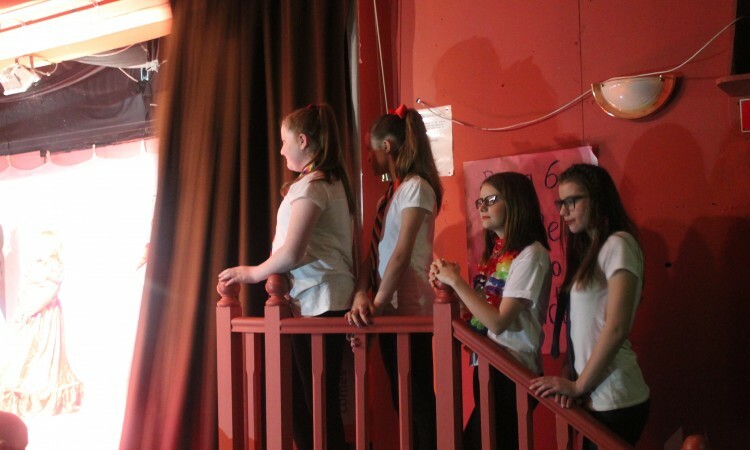 Everyone contributed to make this show outstanding – the girls were all stars! 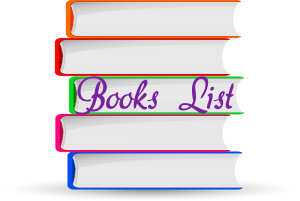 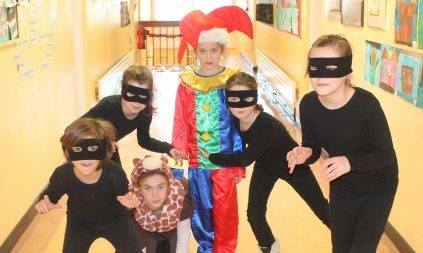 Fourth class decided to take the traditional well loved story of the “Magic Toy Shop”. 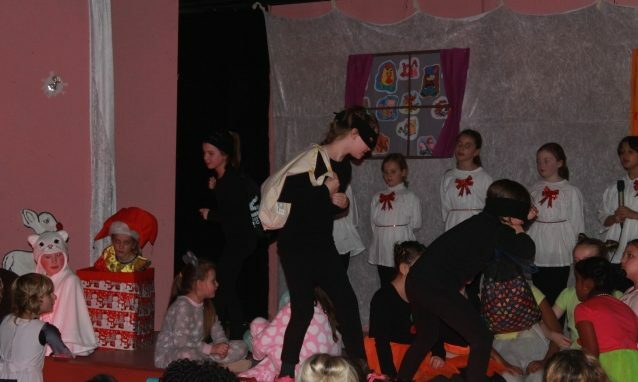 Hans, the toy maker had terrible trouble when his cat Grudles got up to mischief and all the toys came to life for one night! 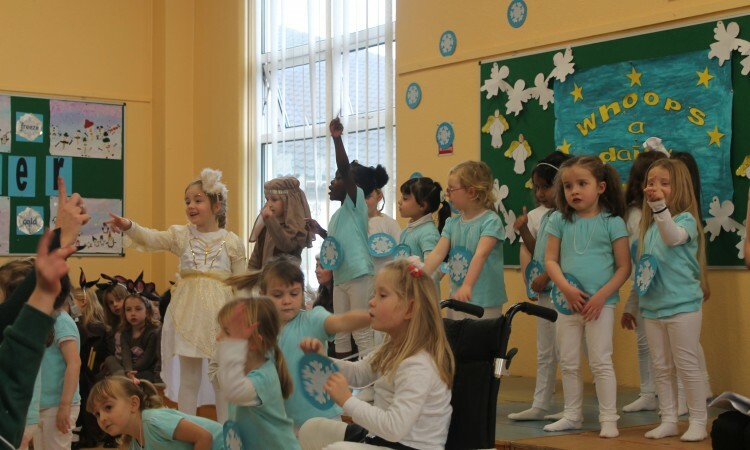 There were marching soldiers, dancing dolls, puppets, a rocking horse and even a jack in the box! 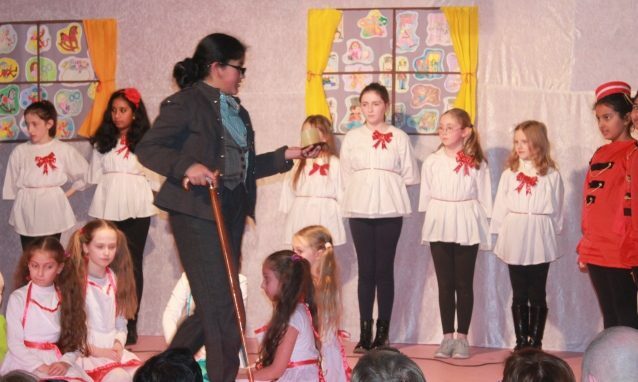 It almost ended in disaster when Han’s precious porcelain doll fell and broke…but fortunately the other toys were able to find some glue and put her back together again. 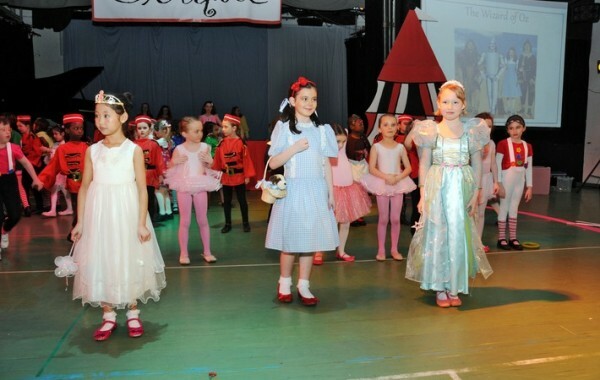 The costumes were stunning! 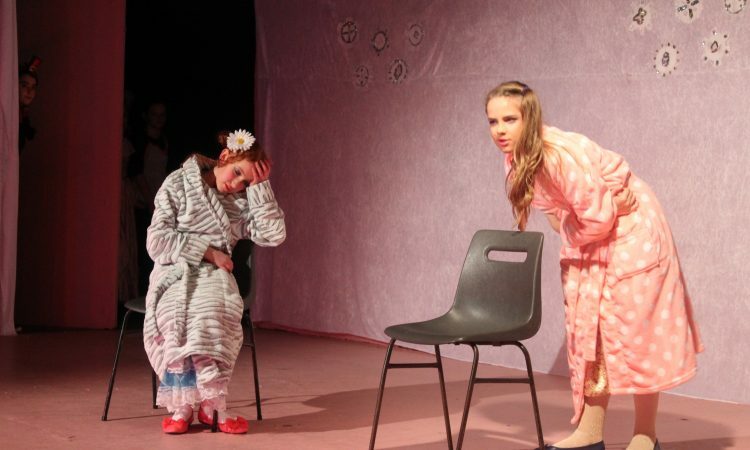 The acting was top class! 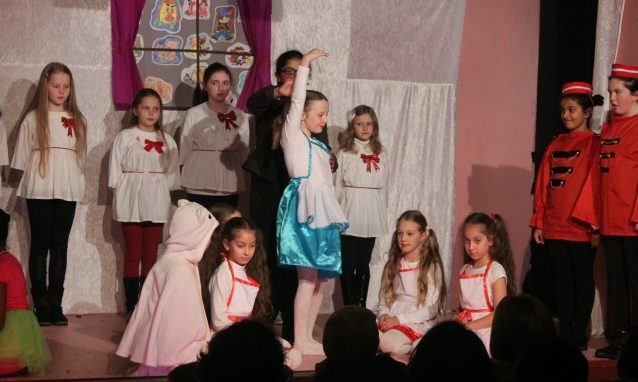 The audience loved the story-line and the animated characters. 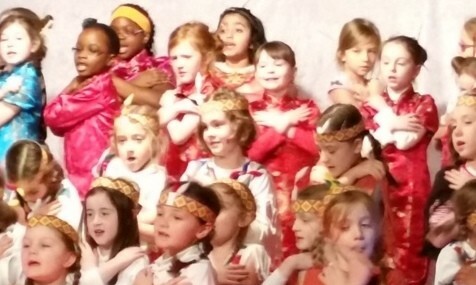 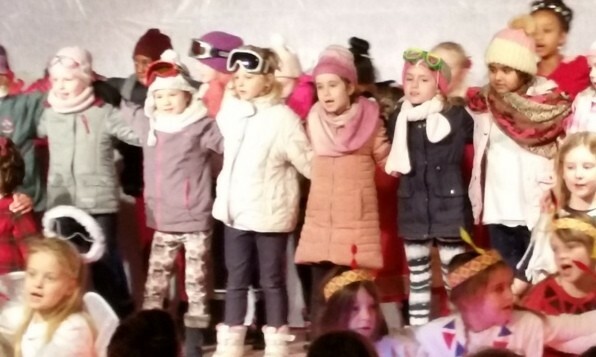 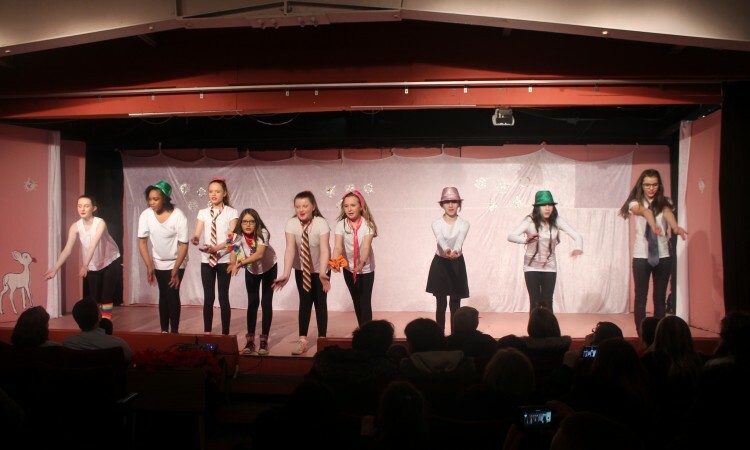 What a wonderful performance – well done girls! 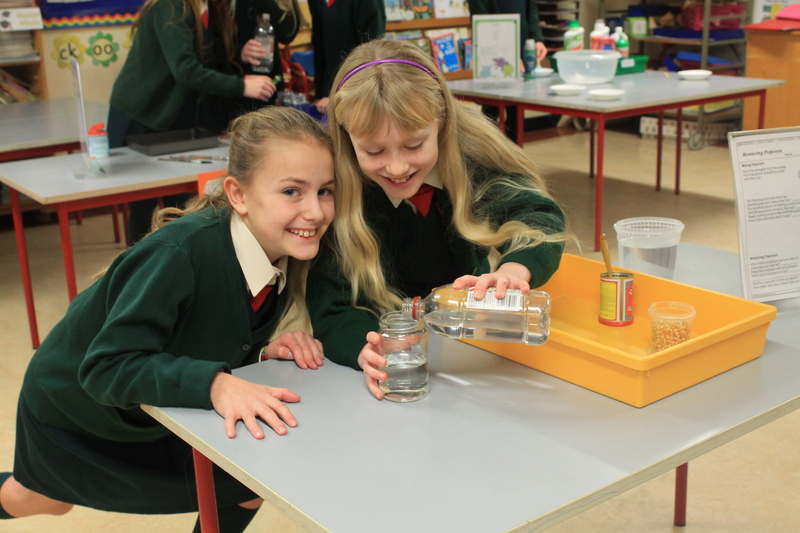 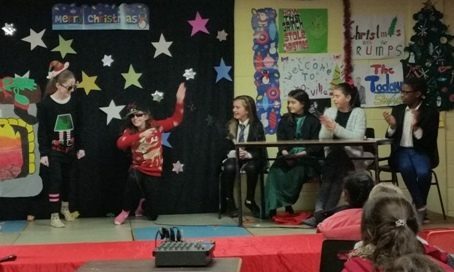 Fifth class created their very own “Christmas Goggle Box” -based on the popular TV show. 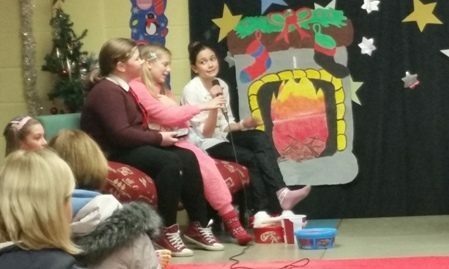 They worked hard on their script to include some of their favourite shows and a lot of humour – such a creative and smart group of children! 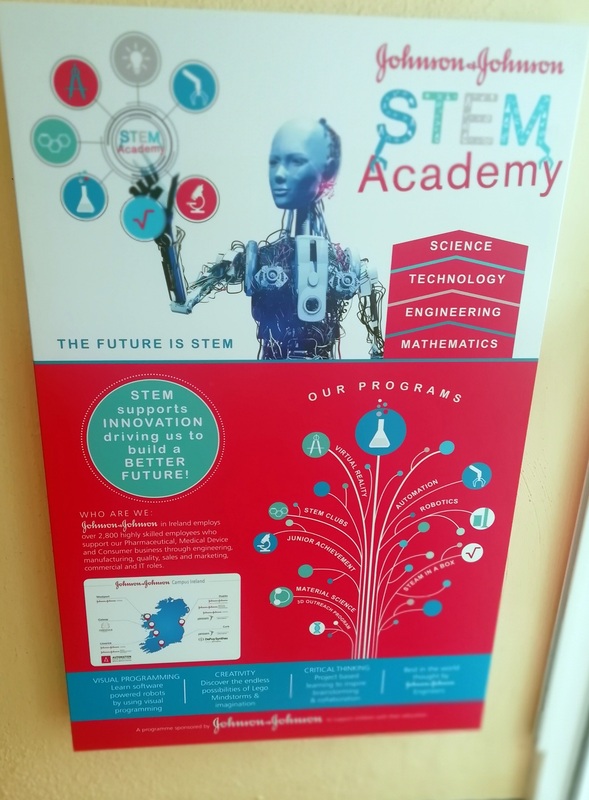 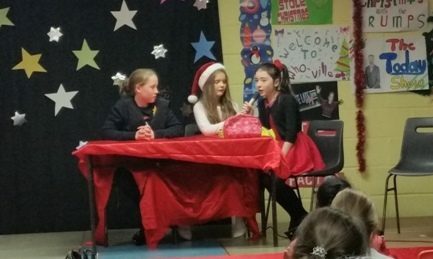 We saw a typical family gathered around the TV watching a variety of shows and celebrities including Donald Trump & Melania, Ryan Tibridy on the Toy Show, Dathaí & Máire from the Today Show and even some X-Factor extracts! 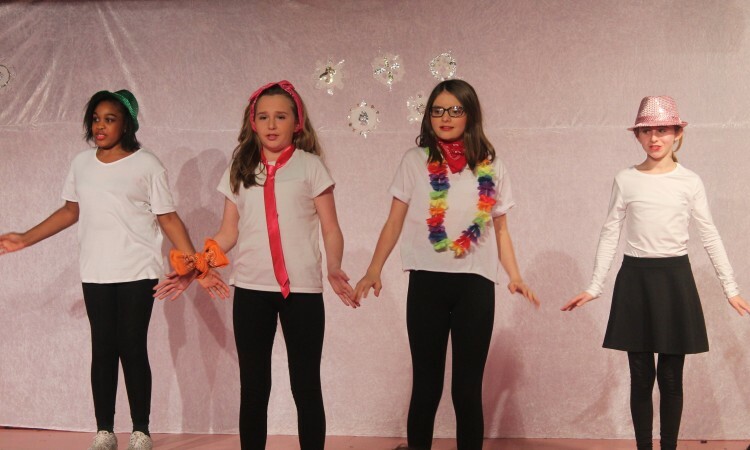 We were most impressed that our girls created a script with such humour and insight and that the actresses captured each character so well! 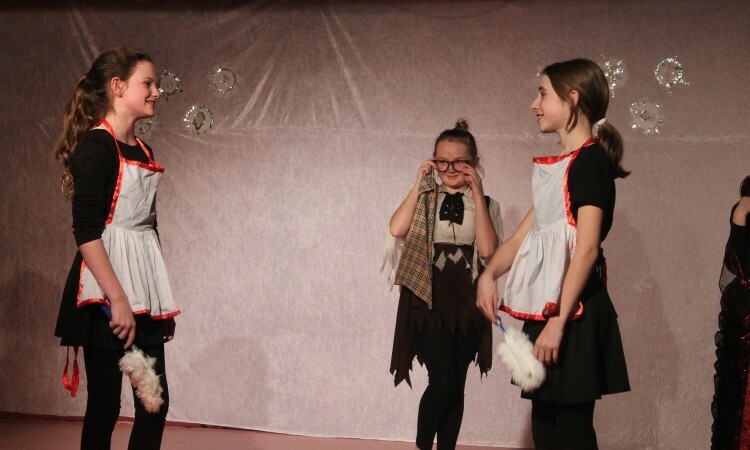 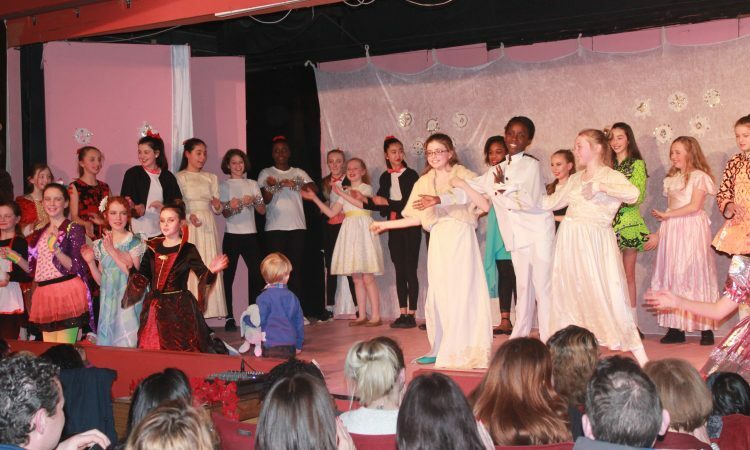 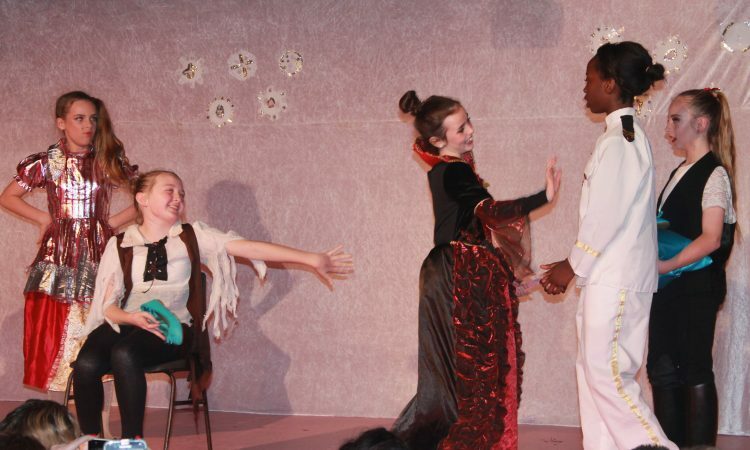 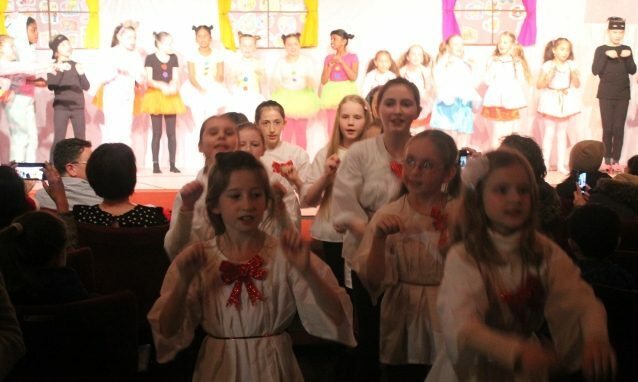 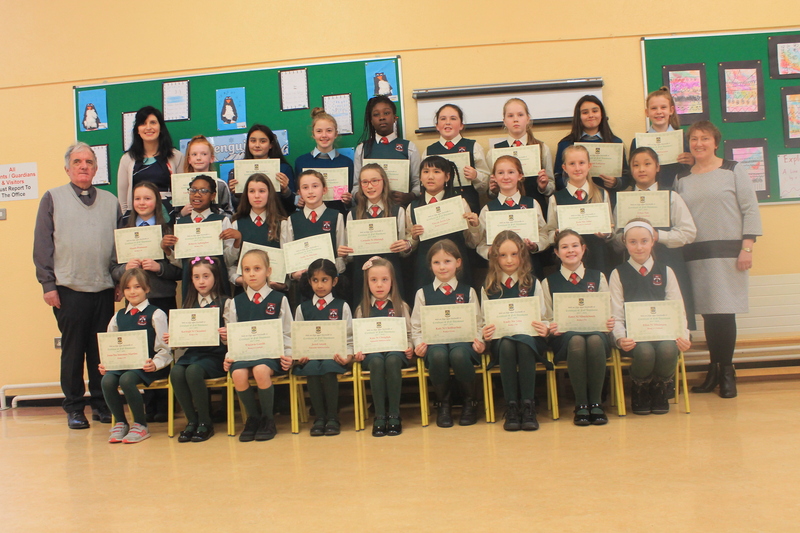 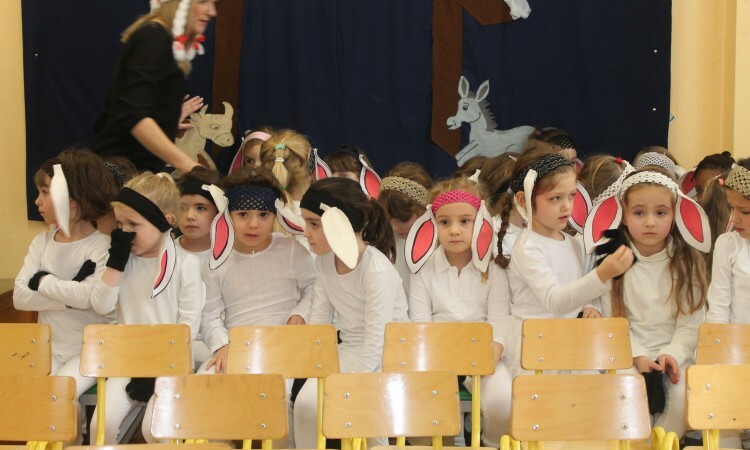 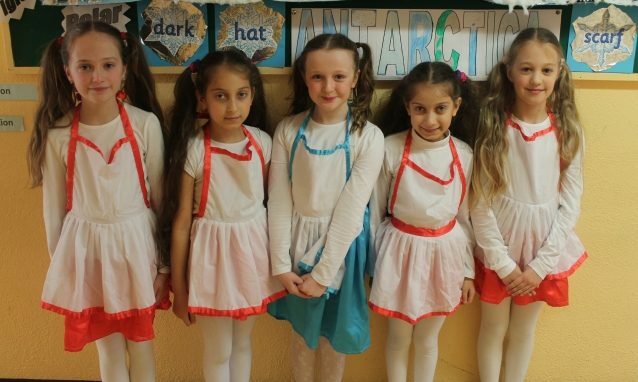 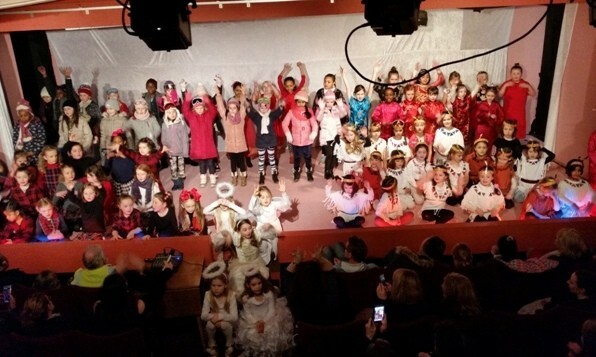 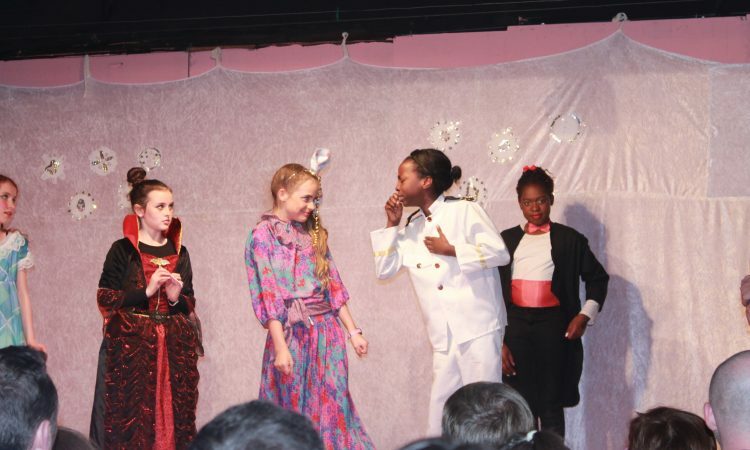 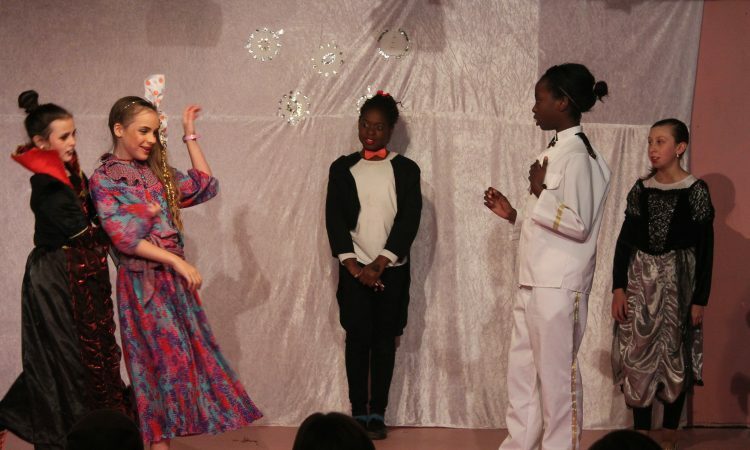 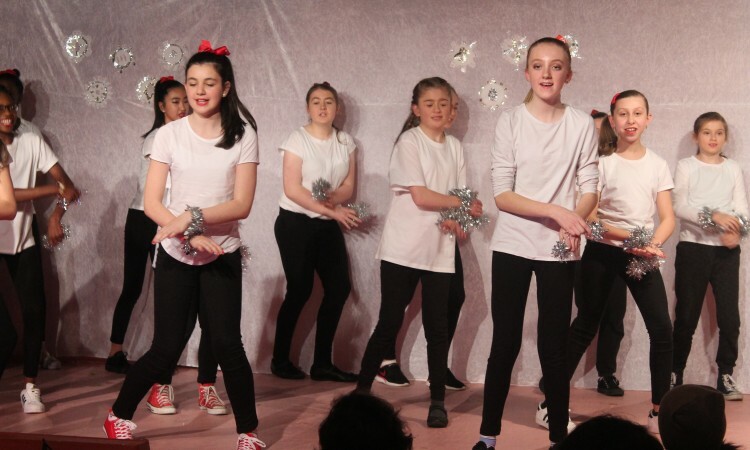 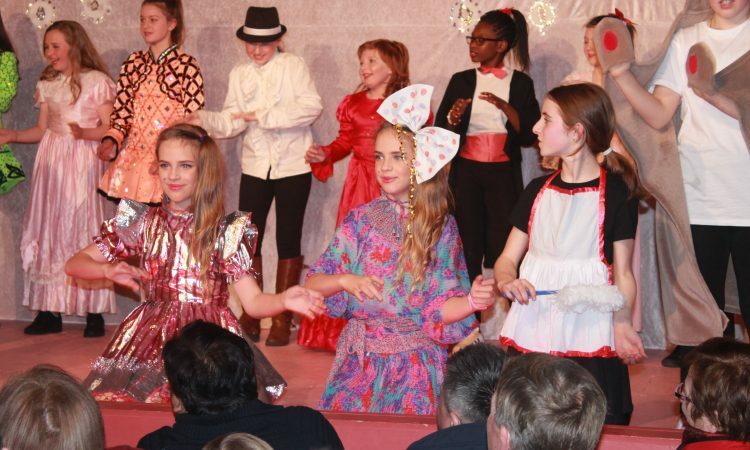 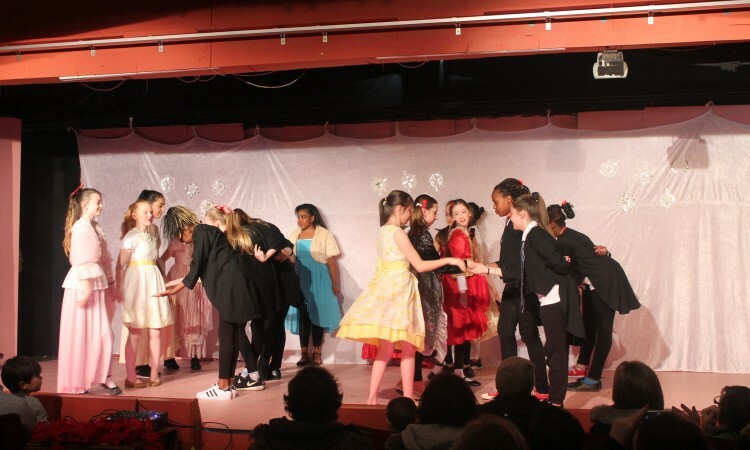 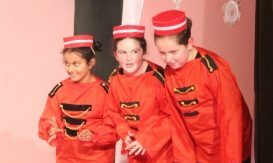 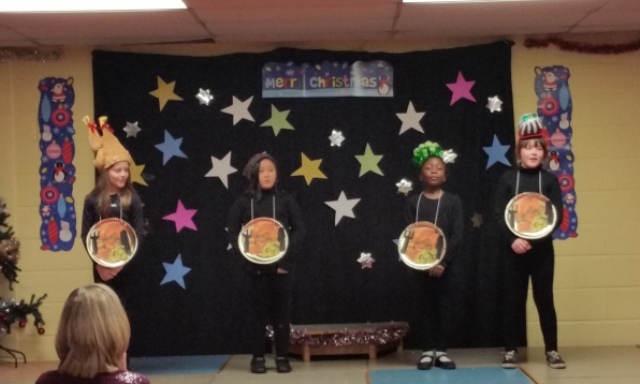 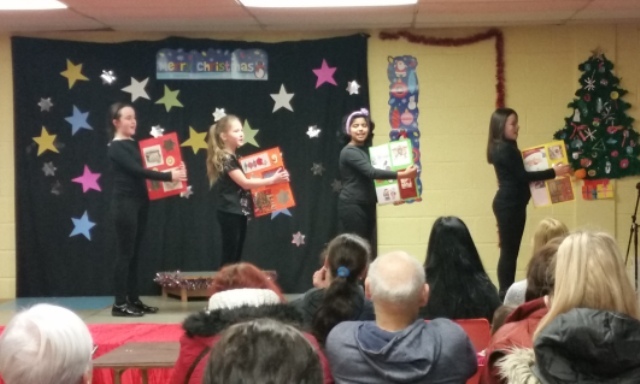 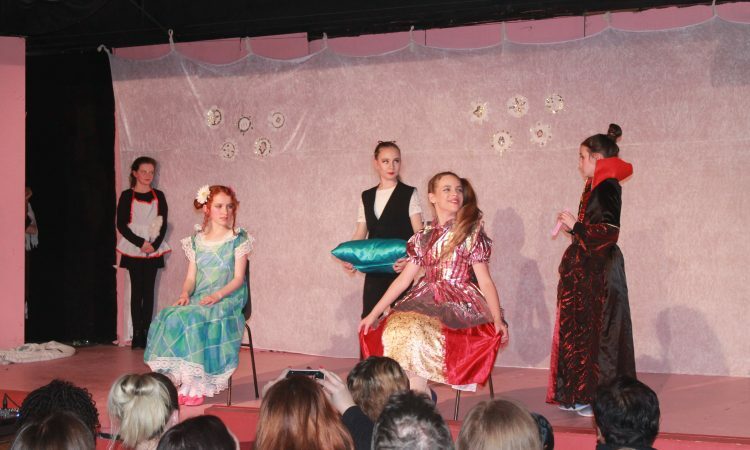 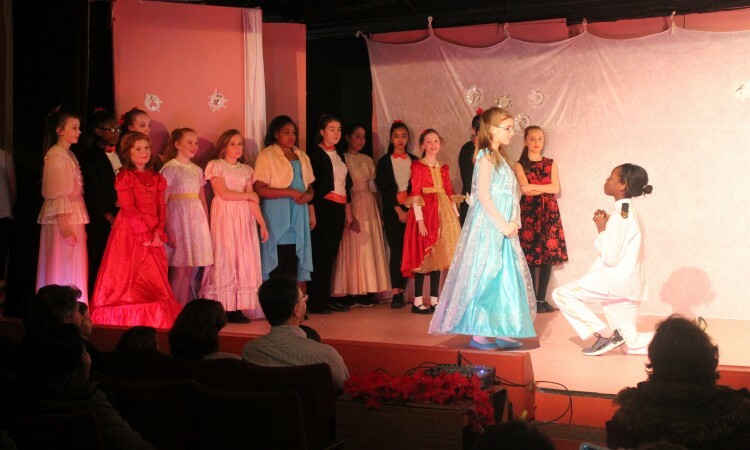 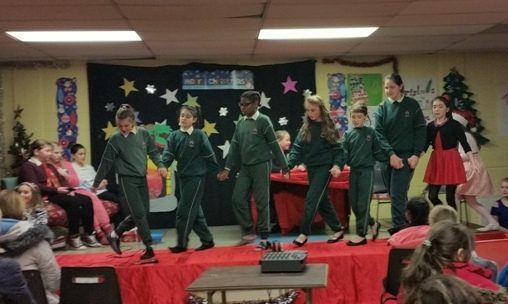 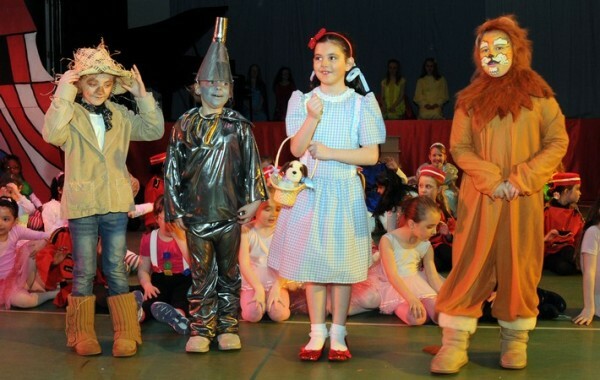 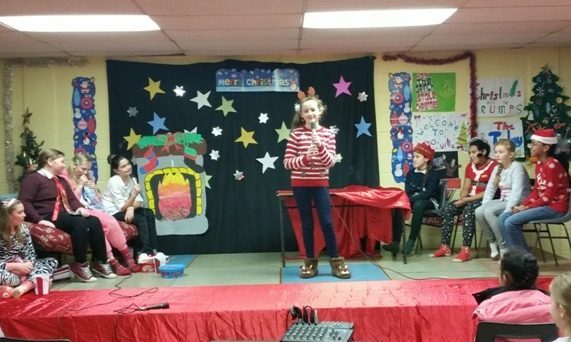 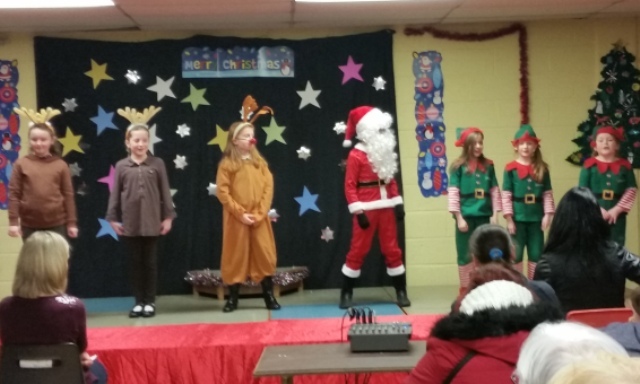 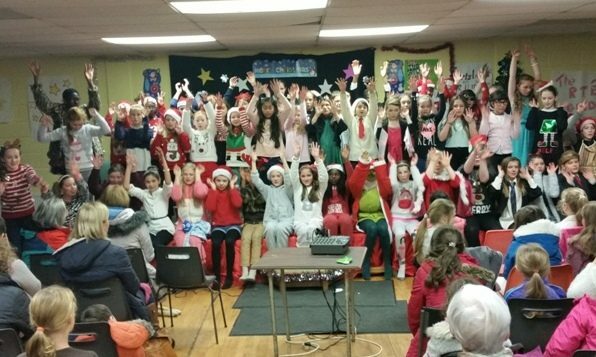 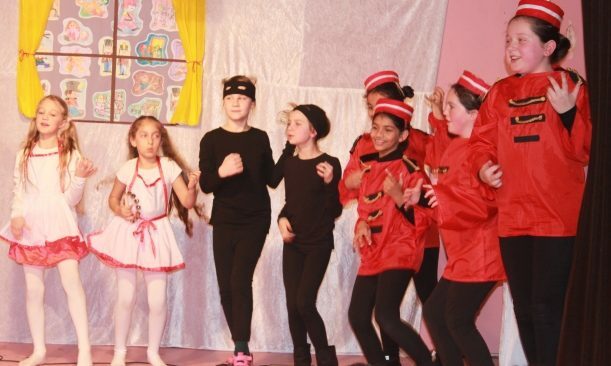 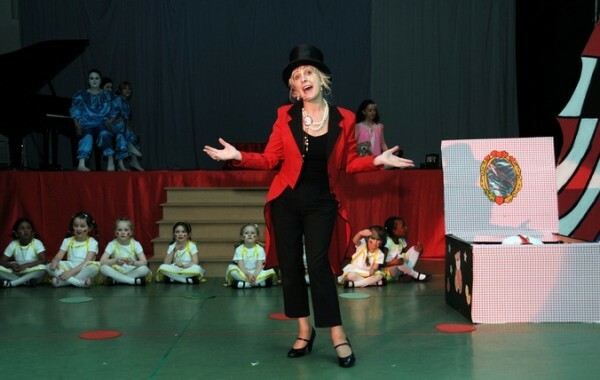 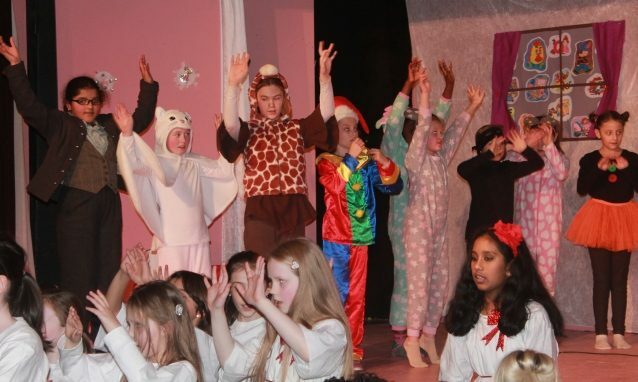 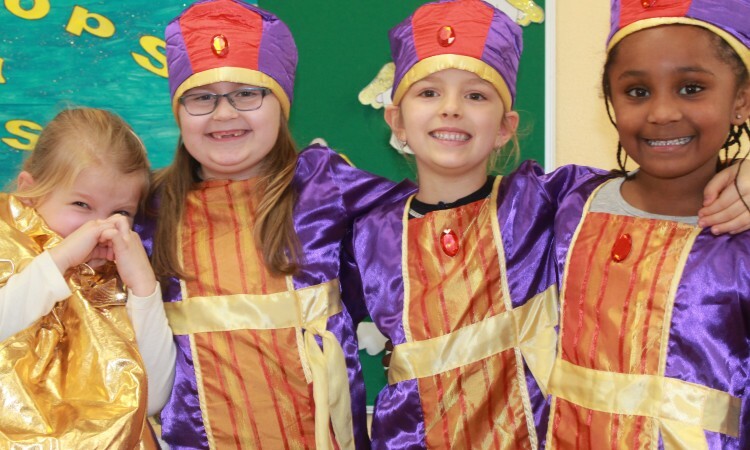 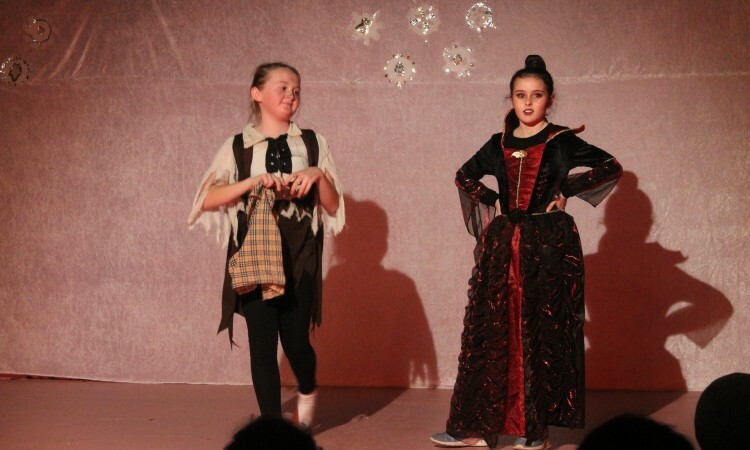 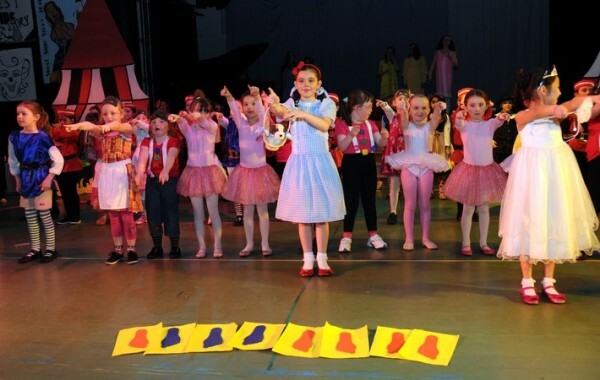 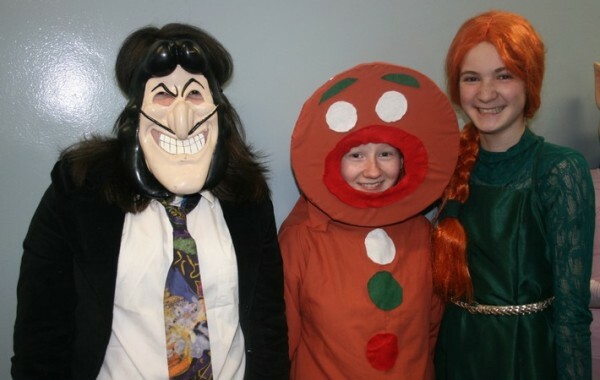 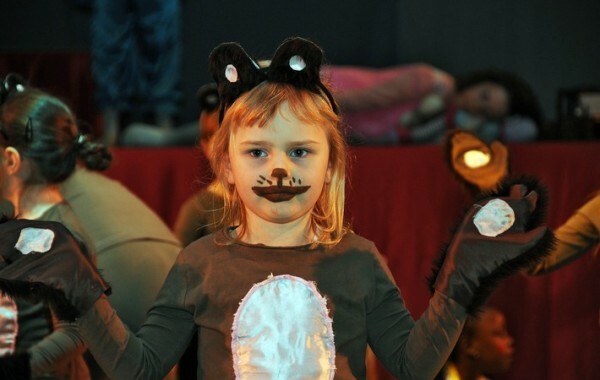 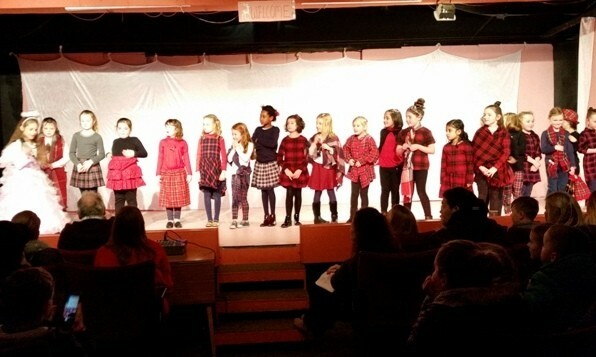 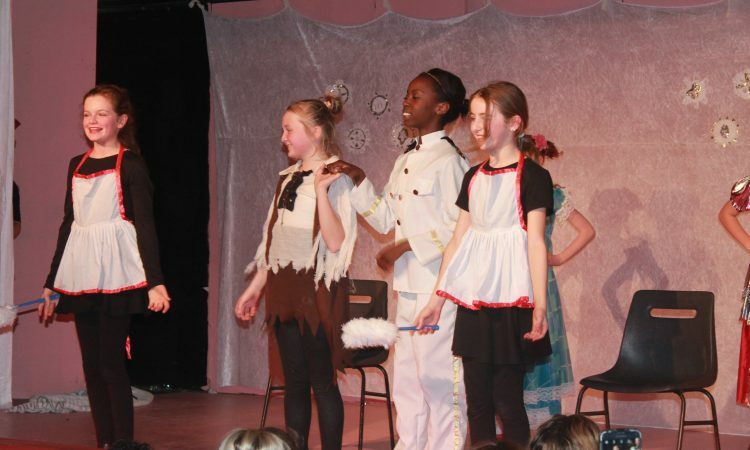 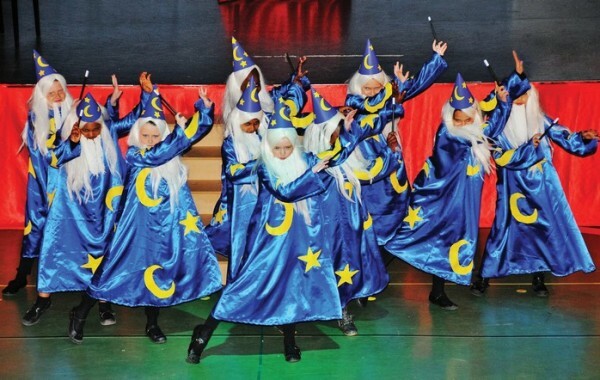 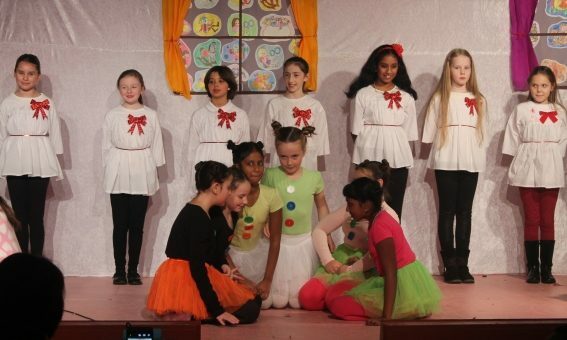 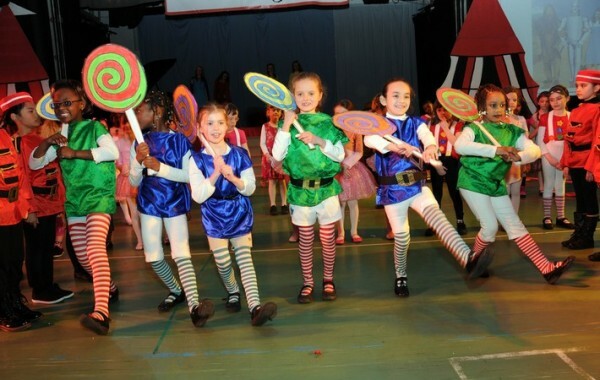 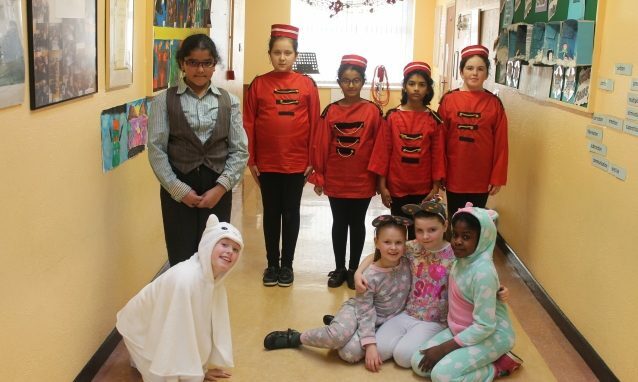 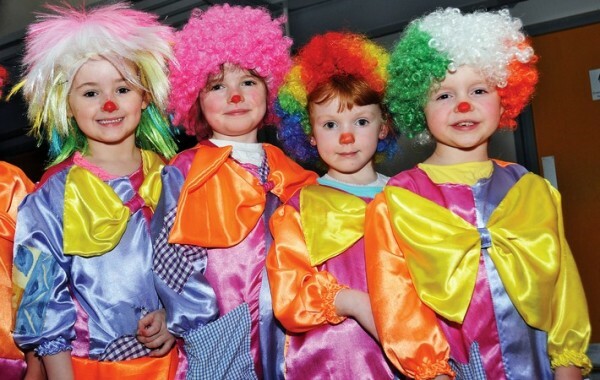 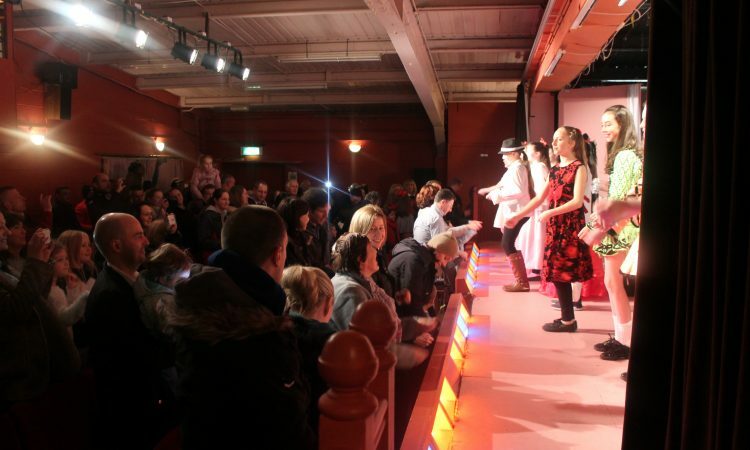 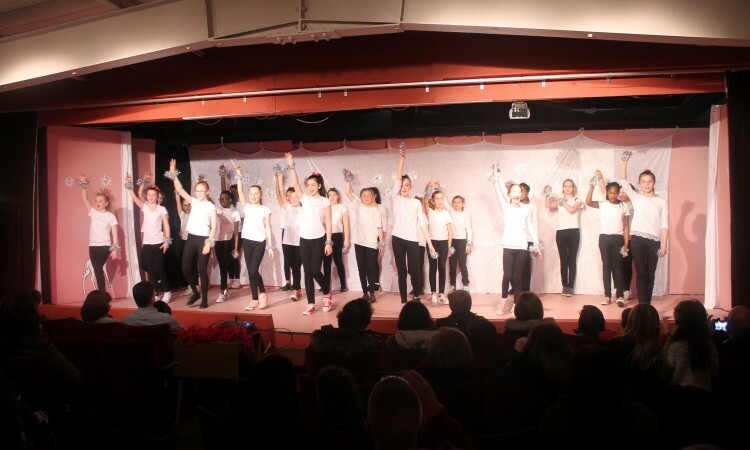 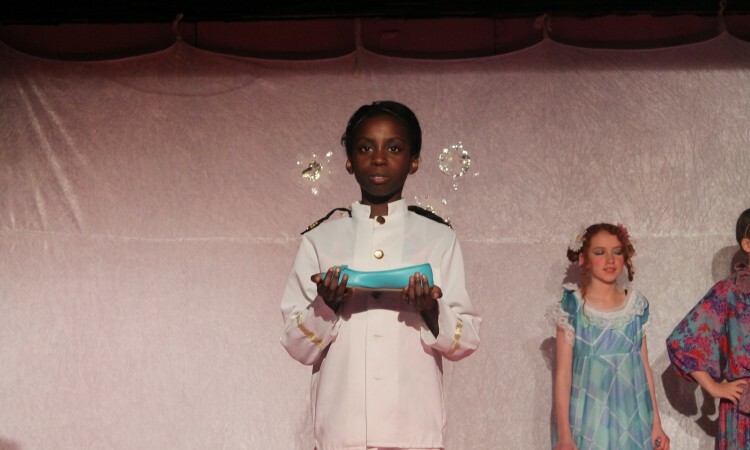 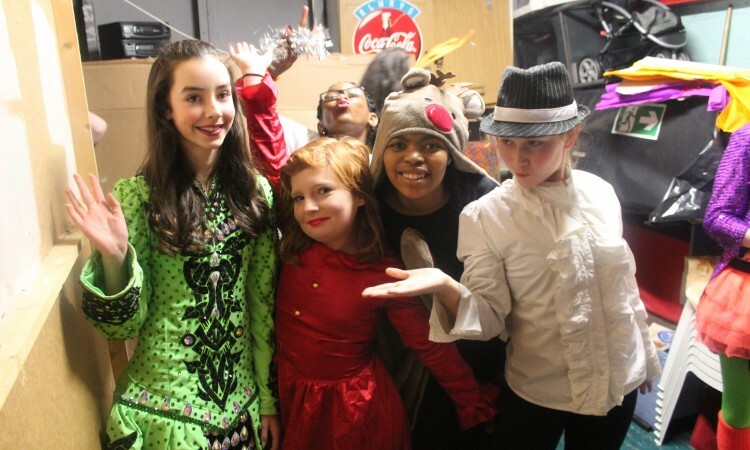 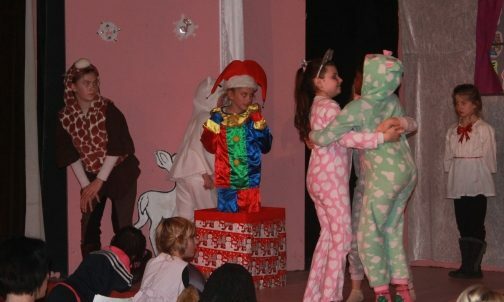 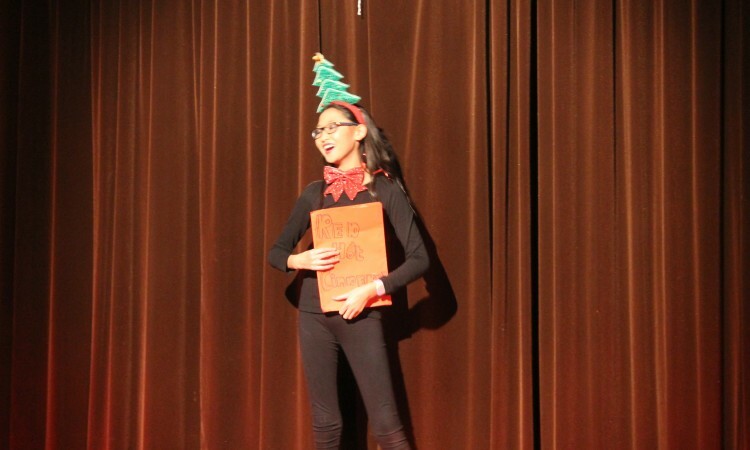 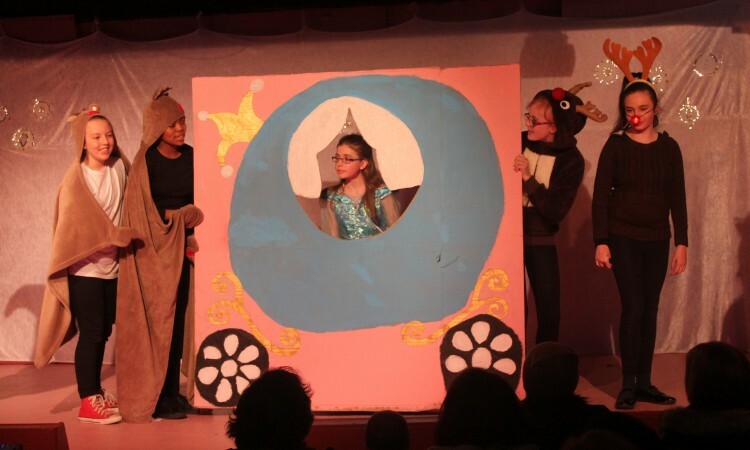 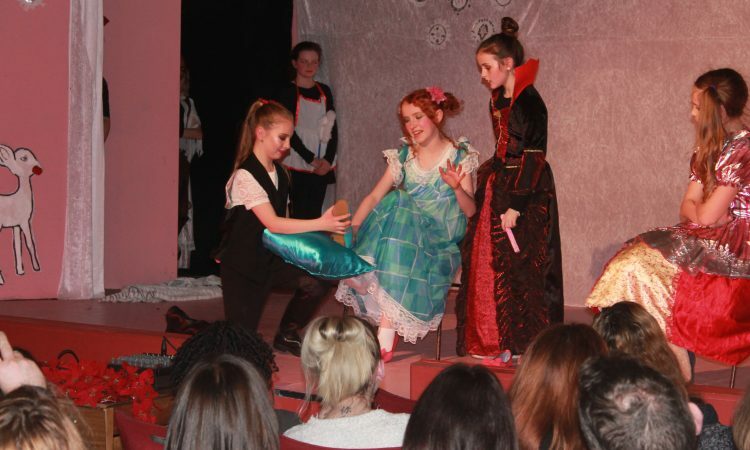 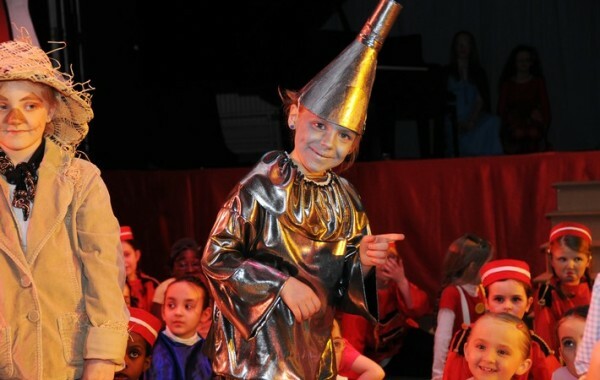 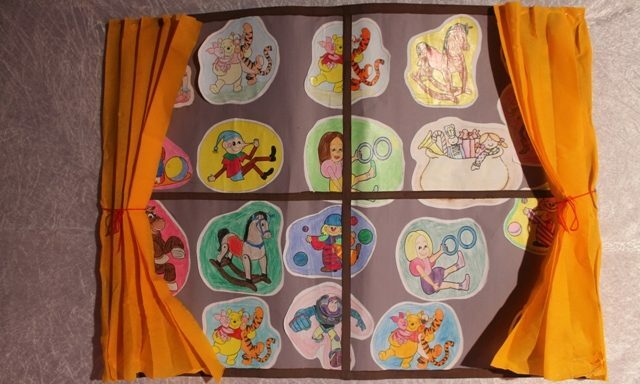 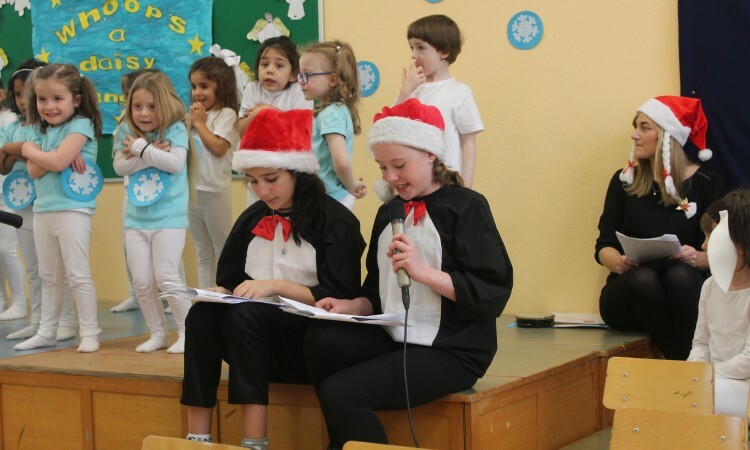 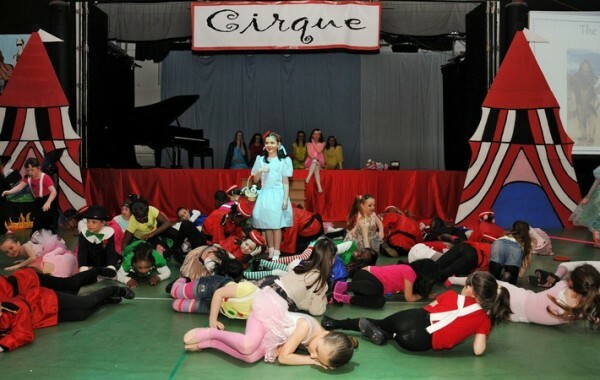 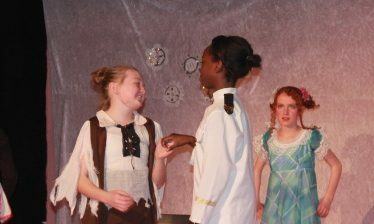 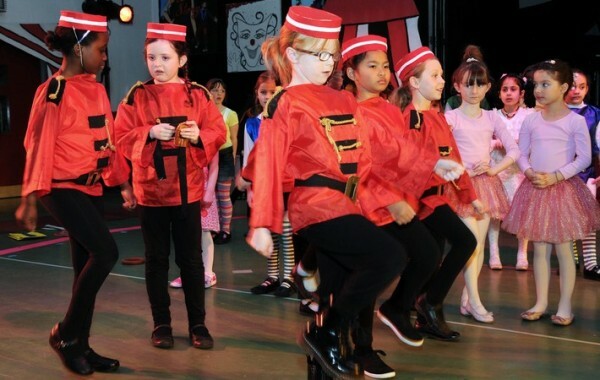 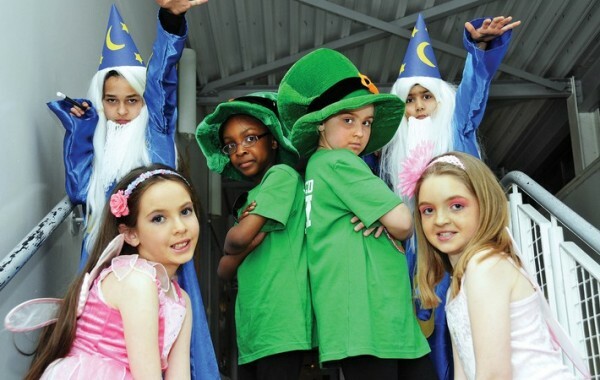 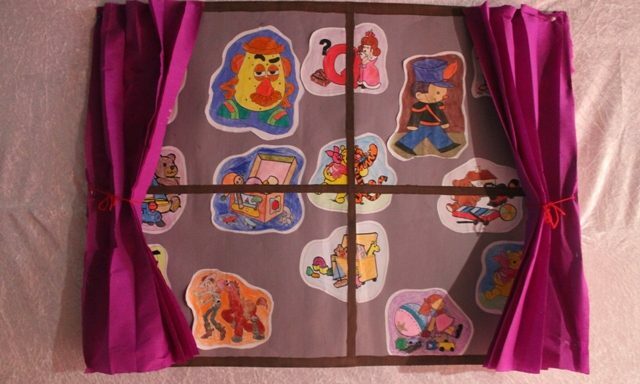 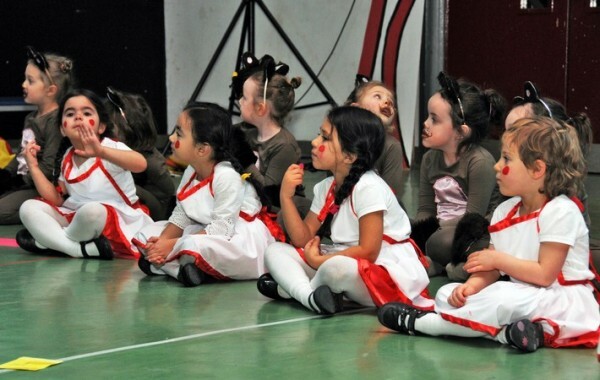 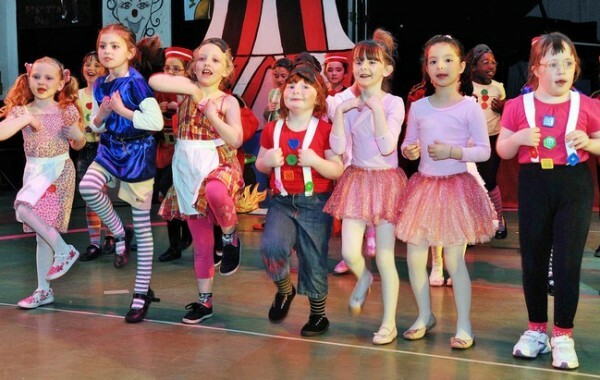 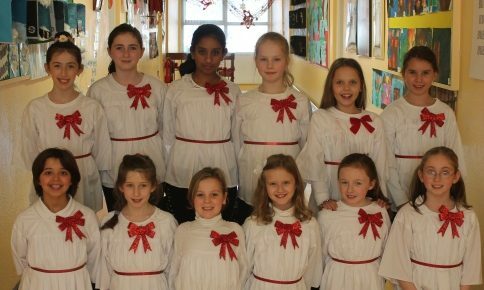 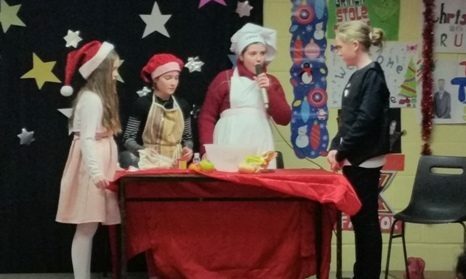 The Sixth Class show was a pantomime – all in rhyme! 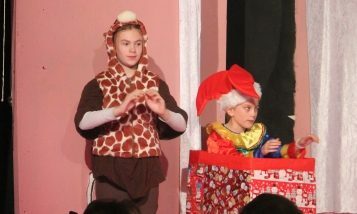 Oh yes it was!!! 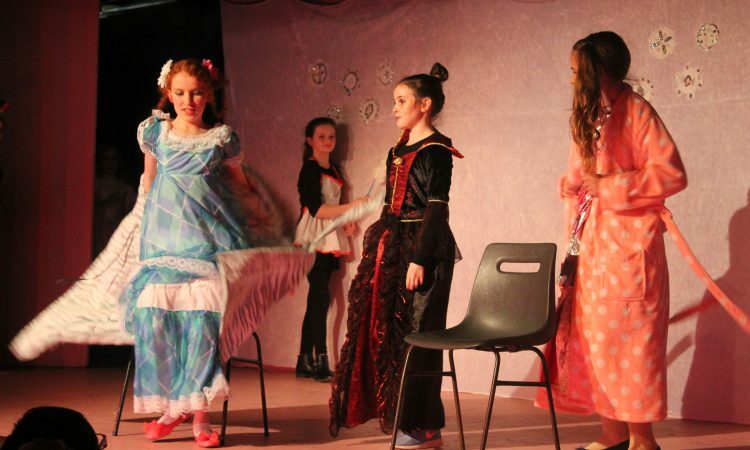 Cinderella was looking for a fella and her ugly sisters were of course getting in the way, with their big feet! 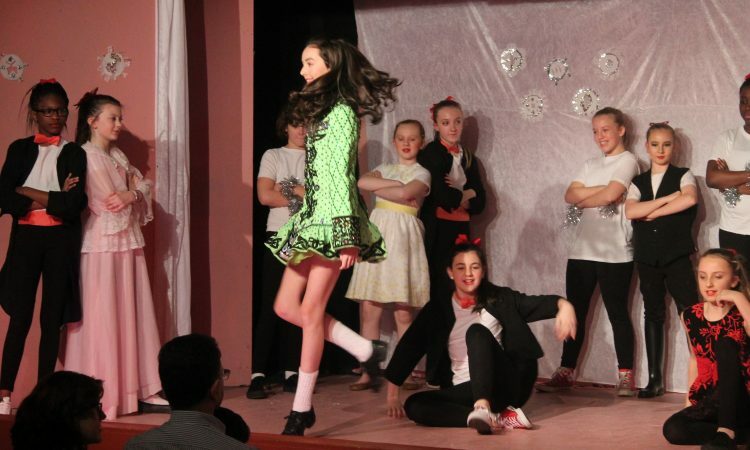 Red Hot Cinders was jam packed with Irish dancing, pop dancing, a minuet and singing, not to mention top notch acting as you would expect in a pantomime! 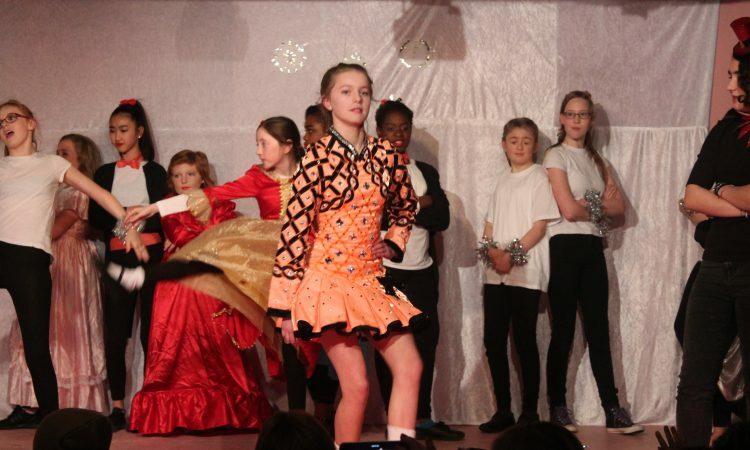 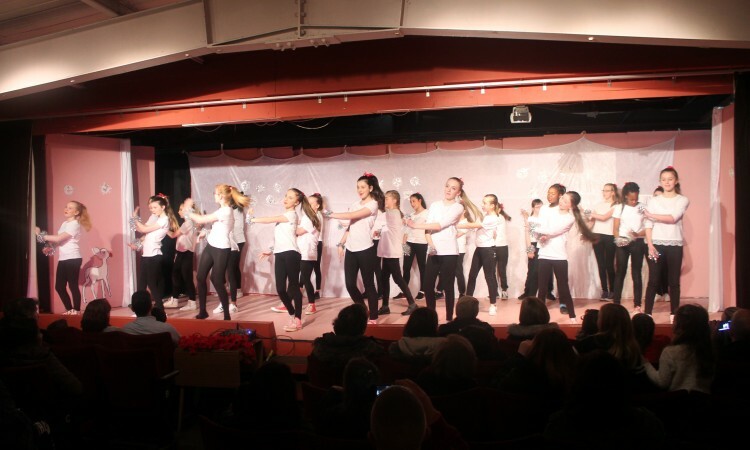 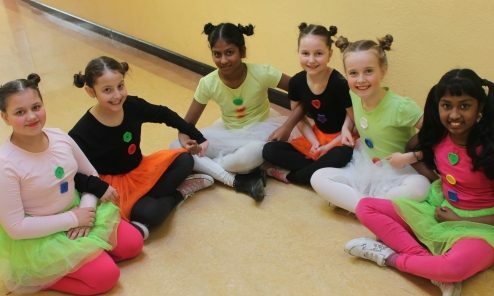 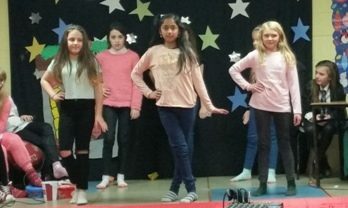 We had audience involvement as the two sixth class teachers danced with the classes to compete for the spotlight – fortunately both classes were winners! 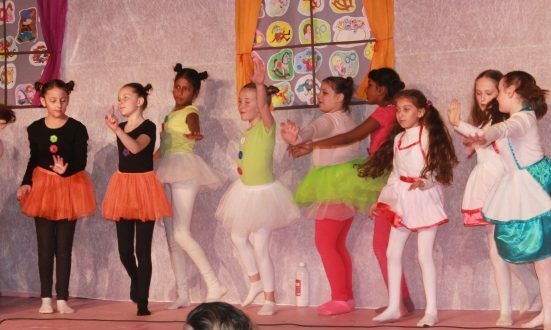 There was great humor and the girls were so confident on stage. 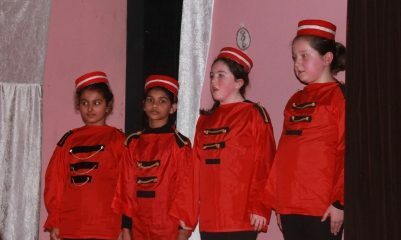 Weren’t they great? 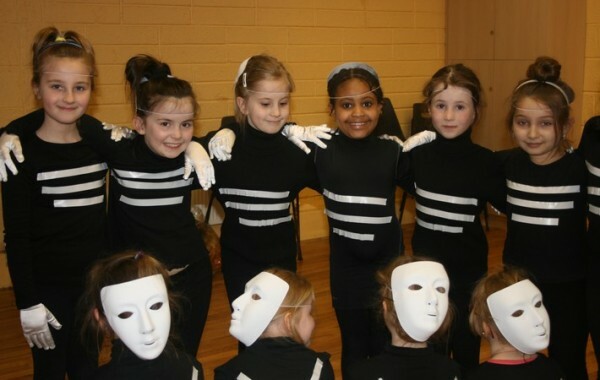 Oh yes they were! 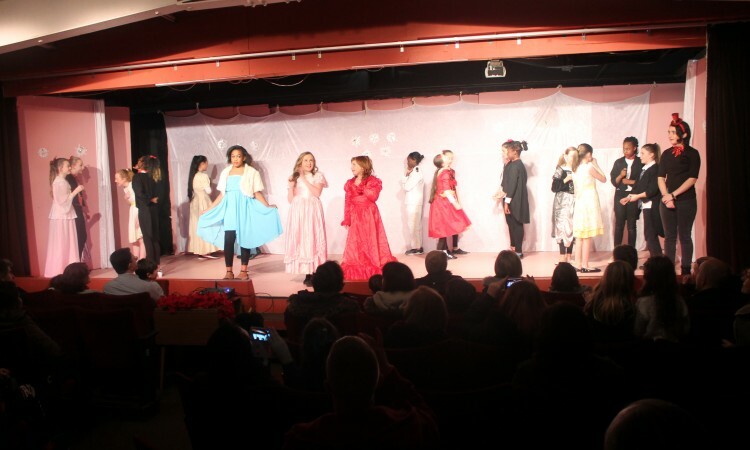 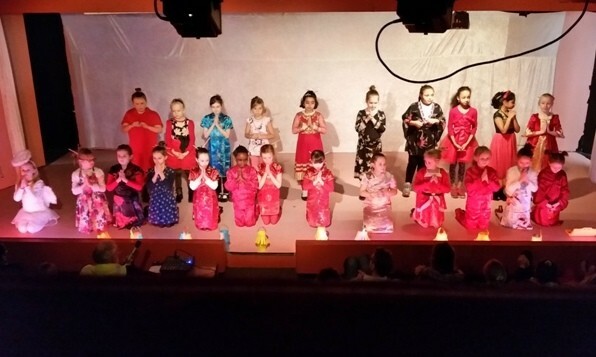 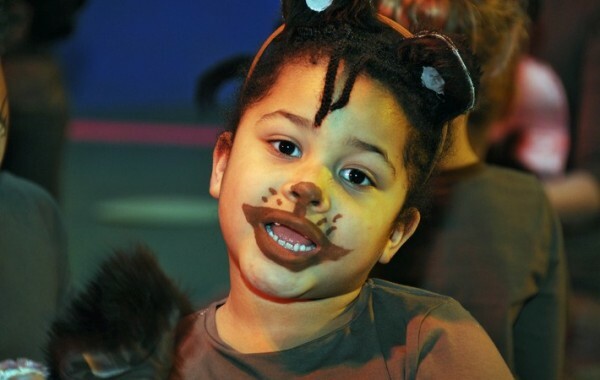 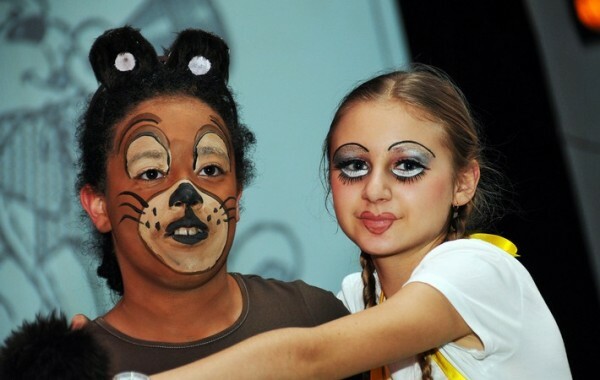 A special word of thank you to parents, teachers and others who contributed to the performances – providing costumes, practicing songs and lines, calming nerves, stage management, introductions, script writing, the set, photography, sound, stage painting, lighting, road crossing, putting out chairs and many other tasks.